This small antique style tin retablo decoration is a wonderful religious folk art accent for your southwest décor. These vintage style tin folk art pieces are all handcrafted in Mexico. These items can be displayed in a traditional home altar, or given as a special religious gift. Assorted Prints Only: We receive many different designs from Mexico and will choose your retablo print from our available stock. 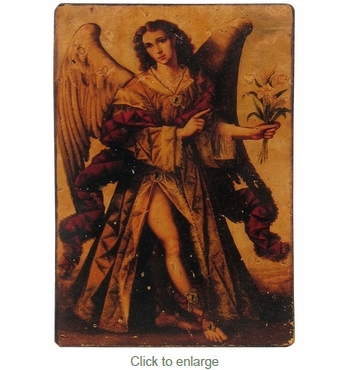 The retablo you receive will most likely be different than the one pictured here. See a few examples at left. Antiqued Mexican Retablo Devotional Painting Print on Canvas - Assorted - 7.5" x 9.5"